Southeast Asia is home to many kinds of bizarre and delicious fruits. 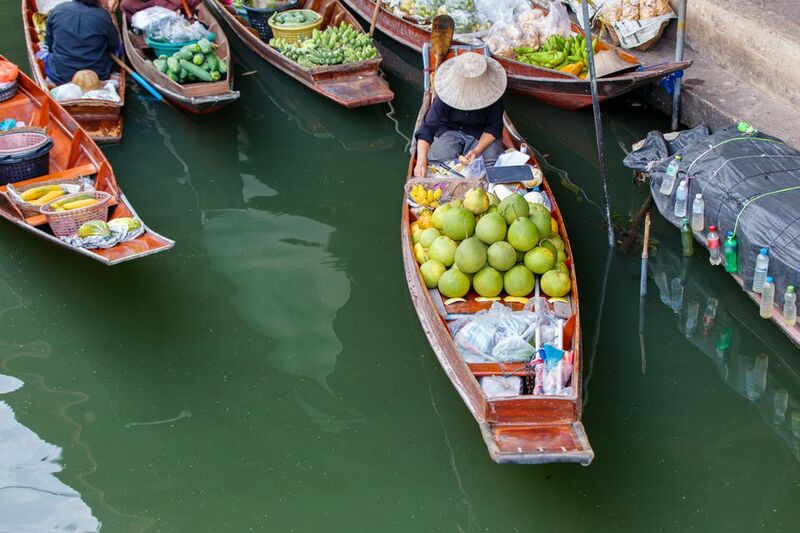 Be adventurous on your next trip to the market and try something new! Keep an eye out for these local fruits that you probably won't find at home. Known as the “king of the fruits,” no fruit in Southeast Asia inspires more of a controversy than the durian fruit. There is no middle ground; people either love or loathe the menacing durian. The smell, which has even been compared to roadkill or vomit, has prompted the banning of durian on public transportation. Once past the medieval-looking exterior and potent smell, the durian yields a soft, delicious flesh with the texture of custard. Numerous health benefits are attributed to the durian, which is high in heart-healthy fat and trace minerals. If you choose to try only one bizarre fruit in Southeast Asia, look no further than the strange durian fruit. If the mighty durian is king, the mangosteen is known as the queen. The mangosteen's semi-firm exterior shell may not be much to look at, but the soft, delicate flesh of the white interior hooks people on the first bite. About the size of a plum, mangosteens are purplish-brown and round in appearance. No knife required; the soft rind peels away easily, staining fingers in the process. The juicy flesh inside nearly dissolves in your mouth in a burst of tangy sweetness. Interestingly, the number of fruit pods inside the rind corresponds to the number of tiny tabs seen on the bottom of the fruit before peeling. Officially known as the pitaya, the dragon fruit is actually native to Latin America. The menacing-looking fruit from cacti has been cultivated throughout Southeast Asia — particularly in Vietnam. Despite having a fierce name and relying on bats for pollination, the dragon fruit is delicious and nutritious. The dragon fruit must be opened with a knife. Once past the leafy skin, the white flesh inside has the texture of a soft apple. Small, black seeds lend a slight crunch to the mild taste much like the seeds in kiwi. Dragon fruit is commonly blended into sweet drinks and shakes. Dragon fruit is high in vitamin C, phosphorous, and antioxidants. Tamarind is another fruit, not particularly attractive on the outside, that Westerners shy away from in markets. Grown in big clusters on trees, tamarinds look like a large, rotten pea pod. The brittle, brown shell breaks apart to reveal hard seeds covered in sweet, sticky flesh. Eating tamarind fruit is a sticky affair; the gooey meat must be sucked off of stone-like seeds in each pod. Fortunately, the taste is worth the effort; tamarind is sour, sweet, tangy, and quite unique. Tamarind is often used to add a sweet, tangy flavor to Southeast Asian dishes such as laksa. The red, fuzzy rambutan is probably one of the strangest looking fruits in Southeast Asia. Despite the other-worldly appearance, rambutan is delicious and fun to eat. Rambutan is best enjoyed when it is fully ripe. Look for a bright red exterior with no white spots. Hawkers will often let you sample one before buying; high-quality rambutans have flesh that comes from the seed easily without too many bits of wood attached. A favorite fruit of Chinese emperors, lychee was appreciated as early as 2000 BC. The small, brown or pink shell can be easily peeled away with fingernails to reveal a white, syrupy ball much like the one found inside of rambutan. Lychee syrup is often used in desserts and even to make a sweet wine in China. Aside from a wondrously sweet taste, lychee comes with numerous health benefits. Consuming just nine small lychee fruit will provide an adult's daily allowance of vitamin C!